At Appcoda, our aim is to teach everyone how to code and build an iOS app. Here you can find a collection of free tutorials that are target for beginners without possessing any coding experience, and developers with some iOS programming experience. All the tutorials listed below are absolutely free. Simply follow the tutorials to kick off your development journey. Other than free tutorials, we also provide premium learning materials to help you become an iOS developer. If you want to create an app but don’t know where to begin, this book covers the whole aspect of Swift programming and iOS 10 development and shows you every step from an idea to a real app on App Store. This book features a lot of hands-on exercises and projects. It assumes you have little or even no prior programming experience. You will first create a simple app, then prototype an app idea, and later add some features to it in each chapter, until a real app is built. During the process, you will master Swift programming and iOS 10 app development. Check out the official page to learn more and get three sample chapters. Since all the tutorials are free, why do I need to get the book? This is one of the common questions from our readers. Our Swift books are not the same as the free tutorials. 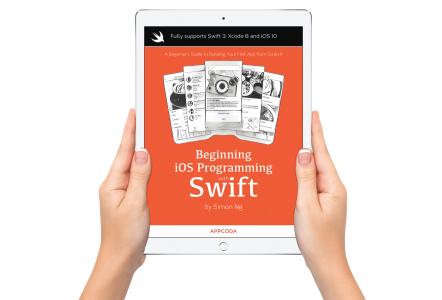 The beginner book is written from the ground up to teach beginners Swift programming and guide them to build a real world app from scratch. All the materials are fully updated for iOS 10 and Xcode 8. Like any technology, Swift will continue to evolve. Thus, change is inevitable. Once you purchase the book, you will get free book updates for one year. We will make sure the content and the source code are compatible with latest version of iOS and Xcode. The books are also available in multiple formats including PDF, ePub and HTML. So you can read it on your favorite device. On top of that, you will get access to our private Facebook group to interact with other learners. We commit to contribute to the developer community, and love to help our readers learn to code. This is why we publish weekly tutorials to share what we know. For free tutorials, however, we are short of resource to review and update all published tutorials whenever a new version of iOS is released. So some of the free tutorials may not be compatible with the latest version of Swift or iOS. You will need to modify some lines of code to make it work. Tutorial #2: How Does the Hello World App Work? Stay tuned. We’ll put up fresh tutorial every week.